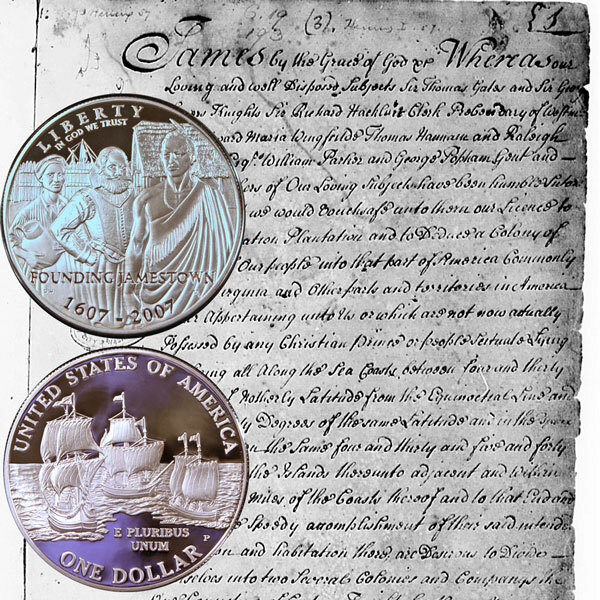 Today, the Jamestown Commemorative Silver Dollar Coin tells part of the story of the early days of Jamestown in January 1608 (January 7, 1607 in the Old Style calendar and January 17, 1608 in the current calendar). Some historians doubt the story of Pocahontas saving Captain Smith. But, when much of the early history was verbal, how can we know for sure 407 years later? First, that Smith was a prisoner “sixe or seven weeks;”second, that Pocahontas saved his life; third, that he then returned to Jamestown and prevented its abandonment; and fourth, that he then, with the aid of Pocahontas (for a week or more) saved the colonists from want until Newport finally arrived. As these statements rest on the same evidence, to impeach a single one of them is sufficient to impeach the rest, and other evidences, direct or circumstantial, either contradict or cast doubt upon each one of these statements. The Pocahontas incident has been woven into a pretty, touching story which has appealed so strongly to human sympathy as to overshadow matters of the greatest historic consequence. The contending for it has been like fiddling while Rome was burning. We should have devoted our time rather to saving our earliest history from the smoke and flame with which it has for so long been concealed or obliterated. It is more important to rescue our foundation as a nation from the ideas conveyed by Smith than it is to contend over the saving of Smith. We may not know why the savages saved him; but as they sent him back with accounts of a ready way to the South Sea, gold mines, etc., it was probably their purpose thus to use him to decoy the weak colonists into some ambuscade. But however this may be, we should not allow personal questions or pleas to conceal or obscure important historic facts. It was really the opportune arrival of Newport with additional emigrants and supplies which saved the colony from want (and it may be from final abandonment by the English or destruction by the Indians) and Captain Smith himself from execution. Even if Smith was first saved by an Indian princess (which at best is an historic doubt), he was saved last by an English captain (which is an historic fact), and but for the last saving the first would have been to little purpose. Monday, January 14, 1608, the new supply landed, and, on the 17th, Jamestown was burnt ; the fire consumed nearly all the buildings in the fort, including the church, the library of Rev. Mr. Hunt, the storehouse for provision, and the store for ammunition. In the mean time, however, owing to the loss of houses and clothing, there was great suffering, for the winter of 1607-1608 was a remarkably severe one not only in Europe, but also in both North and South Virginia, and many of the old men, and of those recently arrived, died from unavoidable exposure to the cold. Was Pocahontas and Captain Smith a romantic view of history? Does it matter? The “pretty” story does not change the bravery and hardships of the early settlers in Jamestown. 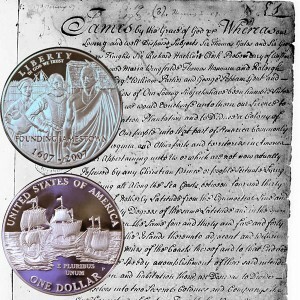 The Jamestown Commemorative Silver Dollar Coin remembers those early days and shows against a portion of the Virginia Company Charter.